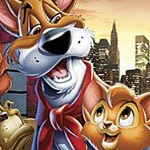 Oliver and Company is Disney’s tepid reimagining of Charles Dickens’ Oliver Twist. Coming just one year before the release of The Little Mermaid, Oliver has largely been overlooked, which isn’t surprising because it’s a forgettable movie. The sparse bonus features on this disc, when compared with other Disney DVDs, would seem to indicate that even the studio doesn’t have much interest in remembering this movie. The movie opens with a box of kittens on a Manhattan street. At the end of the day, only one is left. After a cold, wet, hungry night, the orange kitty (Joey Lawrence) meets up with a streetwise mutt named Dodger (voiced by Billy Joel). Together, they steal some hotdogs from a street vendor. The ensuing chase sequence is entertaining, but the accompanying song by Joel is as unmemorable as the movie. Dodger is part of a canine gang that lives with Fagin, a scruffy human living on a dilapidated boat. Fagin owes money to Sykes, a loan shark who is as menacing as any Disney villain, but a lot less interesting. No sooner does kitty become part of the gang, when he finds himself adopted by a poor little rich girl, who names him Oliver. The two parts of Oliver’s world come together in a very un-Dickensian car chase, while Sykes comes to an end that skirts the limits of a G rating. The biggest problem with Oliver and Company is that the supporting cast outshines the title character. With Cheech Marin as a Mexican Chihuahua and Bette Midler as a haughty French poodle, Oliver doesn’t have much to do other than act cute. As the plot plods along, it’s hard to care about the little guy when so much is happening to the other animals and people in his life. In the Backstage Disney section of the DVD is a five-minute “making of” documentary that is more promotional than informative. It includes a brief interview with a studio executive, who notes that the financial success of Oliver and Company convinced the higher-ups that The Little Mermaid could succeed as a musical. Disney’s Animated Animals is basically a 90-second advertisement with clips from various animal-centric movies. This section also has a gallery of concept art, drawings and promotional materials. There are two shorts from the 1940s starring Pluto as a comic foil for cats. Oliver’s Big City Challenge DVD game will probably be of interest to the younger fans. The DVD also has two sing-along songs. Picture and sound are excellent. The movie is presented in its original 1.66:1 aspect ratio. The sound is Dolby Digital 5.1. Spanish and French language tracks are included. Check out the trailer for Pixar’s Up. Then skip ahead to the movie. Check out the Pluto shorts and skip the rest.